La Tri Club provides a network of information, support services, training & racing activities, friendship & fun for all ages and abilities. LA Tri Club proudly celebrate 18 YEARS as a recognized national leader with a loyal West Coast following. Our community of supportive and committed athlete members help us create extraordinary memories and lifelong friendships through competition, education, volunteering, and awesome social activities! Sure, we swim, bike, and run… but we know that our members have lives and responsibilities outside of triathlons. So we make entry into the triathlon community easy, and staying the course fun! discounts, and rewards programs. From transition tips to shaving secrets, our members learn how to achieve success and truly enjoy leading a triathlete lifestyle. 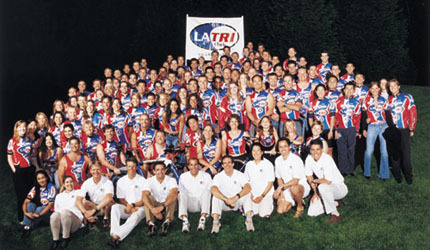 The LA Tri Club was founded in August 2000 after Paul Hekimian presented Larry Turkheimer and Nick Gardner with his vision of an independent triathlon club to benefit the triathlon community in and around Los Angeles. They enlisted the help of a few others, including Holger Beckmann, Ian Murray, Lloyd Taylor, Jerry Enriquez, and Julie Oh, to help launch the early LA Tri Club with the goal of building a strong community of triathletes linked together by a sense of camaraderie. Through this network of like-minded athletes, the exchange of ideas and information about training, gear, etc. quickly became one of the key features of the club. Over time, structured training sessions led by professional coaches and group member-led trainings led to both individual and team success. As the sport became even more popular, LATC continued to expand its membership base, affiliations with coaching leaders in the community, and local and national race leaders. This allowed the club to provide greater support to members with quality resources, robust training events, and a stronger race presence. Since the beginning, LATC has sought to help members find balance between their busy lives and families, and a sometimes all-consuming training / racing schedule. With that in mind, LATC generates operating revenue solely through membership dues and carefully selected sponsorship affiliations. Today, LATC continues to promote the enjoyment of the Triathlon Lifestyle to a wider community and supports members of all skill-levels and abilities. We are proud of the value offered in membership and the over 10,000 athletes we have supported over the years. The spirit and life of the LA Tri Club resides in its members and their support for one another, and we give thanks to our members for 18 awesome years. The LA Tri Club is proud of the accomplishments of our members. Following are just some of the accomplishments that make up the LA Tri Club’s Hall of Fame.